Genuine 100% KELLER VSS Maple Shells are available in 6 & 8 ply for Toms, 8-ply for Bass Drums and 10 ply for Snares. Every Drummer and Drum manufacturer knows these shells, and have been using them for years. These are the VSS Maple Shells "Vibrating Sound Source", and they are the preferred wood for Performing Musicians through out the globe. The shells are ready for finishing and the surface is sanded smooth. 14" X 14" 6 ply Tom Shell With 45 degree Bearing Edge. 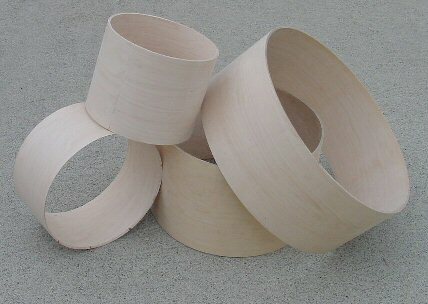 14" X 14" 8 ply Tom Shell With 45 degree Bearing Edge. 14" X 16" 6 ply Tom Shell With 45 degree Bearing Edge. 14" X 16" 8 ply Tom Shell With 45 degree Bearing Edge. 16" X 14" 6 ply Tom Shell With 45 degree Bearing Edge. 16" X 14" 8 ply Tom Shell With 45 degree Bearing Edge. 16" X 16" 6 ply Tom Shell With 45 degree Bearing Edge. 16" X 16" 8 ply Tom Shell With 45 degree Bearing Edge. 14" X 5" 10 ply Snare Shell With 45 degree Bearing Edge. 14" X 5.5" 10 ply Snare Shell With 45 degree Bearing Edge. 14" X 6" 10 ply Snare Shell With 45 degree Bearing Edge. 14" X 6.5" 10 ply Snare Shell With 45 degree Bearing Edge.